Issue: ThinDesktop returns the error message: "The application was unable to load a required virtual machine component. Please contact the publisher of this application for more information." Cause: For April 2015 Microsoft security updates, Microsoft pushed KB3045999. Due to some incompatibility, ThinDesktop is unable to launch and the desktop is rendered unusable. ThinDesktop 2.x users will need to uninstall KB3045999 to restore functionality. After uninstalling the update and rebooting, ThinDesktop will return to a working state. Customers running ThinDesktop 2.x will need to upgrade to ThinDesktop 3.x before KB3045999 can be installed. It is highly recommended to upgrade to ThinDesktop 3.x ASAP. ThinDesktop 2.x is out of support and no further updates will be developed. Our latest product, ThinDesktop 3.x, supports all operating systems Windows XP and higher with full support for Windows user account control. It also includes the ability to turn the product on and off. From a command prompt with administrative rights: wusa /uninstall /kb:3045999 /quiet. The above command will reboot your system after the hotfix has been uninstalled. Add /norestart to reboot manually. 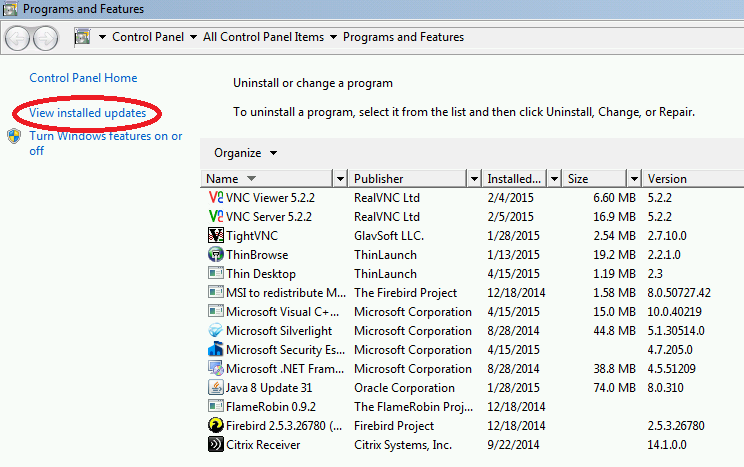 From Control Panel | Programs and Features, select View Installed Updates. 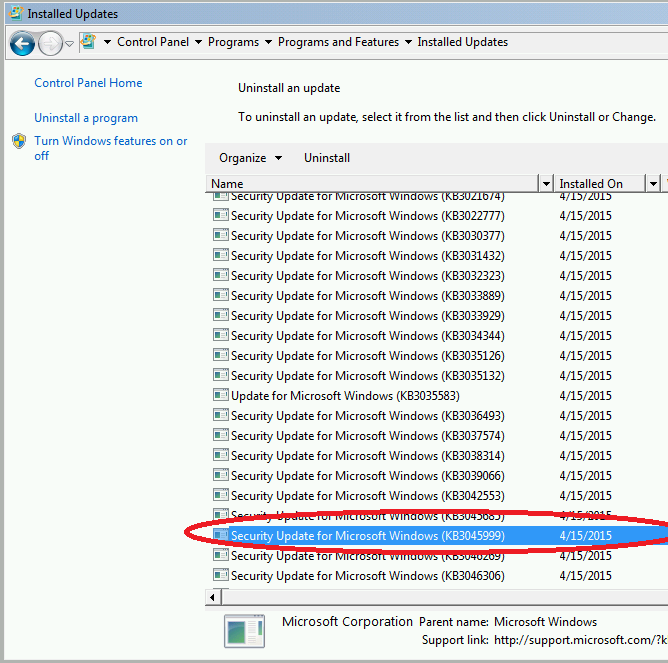 From Installed Updates, find Security Update for Microsoft Windows (KB3045999) in the list. Note: Sorting by Installed On may make finding the update easier. Right click on the update and select Uninstall. When asked to uninstall, select Yes. Wait period of time until login has completed. Press Control+Alt+Delete and select "Task Manager". Select File | Run. Enter explorer.exe and click Ok. Desktop should start and you should be able to use Explorer. Step One: Download the latest ThinDesktop 3.x trial from the website. Let us know if you have any questions or issues. We are here to help! Step Two: Send support@thinlaunch.com your activation "A" key. For customers current on maintenance, a TD3 license key will be returned; otherwise a link to renew your maintenance will be returned. Step Three: To deploy, uninstall ThinDesktop 2.x, install ThinDesktop 3.x, license, configure, and go!